Handmade rugs are a chronicle of civilization. Today, they testify about the fusion of global culture. workshops, and help relieve the suffering of the Tibetan people. New ways travel at the speed of sound. The soul of the rug lives on. Click here for the latest in Joseph's announcements and Oriental Rug news. We offer cleaning, ORRA certified appraising, padding and restoration. We are your one-stop shop for the life of your rug. Joseph's Oriental Rug Imports in-house staff will guide your Oriental rug purchase, explain its history and value, situate the rug in your home and help maintain the rug's beauty for a lifetime. Carpets are dusted and vacuumed before being hand-cleaned with a 7.0 phosphate oriental rug shampoo. Schedule your rug cleaning online, click here to contact us. Durahold rug pad is recommended for installation of an Oriental rug placed on any hard surface. Durahold has a needle-punched construction, made with synthetic materials. This non-allergenic padding has a natural rubber backing that grips hard floor surfaces. The heat-set ridges on the top surface of Durahold will effectively grip your area rug. For an accurate fit, we suggest you first measure across the width of your area rug. Then measure from one fringe end to the other, excluding the fringes in your measurements. The padding will be cut 3 inches under the actual rug size to allow for a slight bevel. Durahold can be cut with shears or a carpet knife. The padding is 1/4" thick. For an accurate fit, we suggest you first measure across the width of your area rug. Then measure from one fringe end to the other, excluding the fringes in your measurements. The padding will be cut 3 inches under the actual rug size to allow for a slight bevel. NoMuv can be cut with shears or a carpet knife. The padding is 1/4" thick. Rubber Anchor rug pad is recommended for installation of an Oriental rug placed on any hard surface where a tripping hazard or door clearance are issues. The 100% natural rubber construction will keep the Oriental rug in place while not harming your hard surfaced floor. For an accurate fit, we suggest you first measure across the width of your area rug. Then measure from one fringe end to the other, excluding the fringes in your measurements. The padding will be cut 3 inches under the actual rug size to allow for a slight bevel. Rubber Anchor can be cut with shears or a carpet knife. The padding is 1/16" thick. We have allocated our appraisal services to attorneys, accountants, museum curators, insurers, bank and trust officers, independent appraisers, and auctioneers. Professional rug appraisals are a highly skilled, specialized task. An appraiser must not only know how to identify your rug, they must also know how to accurately assess its market value. To assure that your Oriental rug receives an accurate appraisal, we recommended you seek an Oriental rug dealer with in-depth knowledge in the field of Oriental rug identification and market evaluation. Many people choose to have their Oriental rugs evaluated by an antique dealer or an auctioneer. If they lack specific knowledge of the Oriental rug market and do not have decades of rug-handling experience, most of these appraisers will not be able to accurately determine the true value of your Oriental rugs. Joseph’s will accurately determine the type of Oriental rug that you own by identifying the country, district or province, area, and town or village from which it originated. We will then evaluate the rug's weave by determining the knot style and density, warp, weft and pile textiles, weft color, pile depth and more. We will determine the dye type, the approximate age, the condition for its age, your rug's repair history and much more. We use every possible method available to accurately determine your rug's true market value. Valuation for insurance scheduling or casualty loss. Fair market value appraisals as required by the IRS for Estate Taxes and Charitable Donations. Appraisals meeting the requirements of the IRS "Art Board" are available. Acquisition advice to assist buyers in dealing with the numerous issues related to authenticity and value. Advice to sellers on how to identify the highest and best markets for their rugs. Provide qualified restoration and maintenance. If you would like to have your Oriental rug appraised by Michael Joseph, please contact us to set up an appointment. Oriental rug repair is one of the many services offered at Joseph’s Imports. We are lucky to have Mouladad on staff as our textile technician. Mouladad’s expertise in repairing textiles is second to none. His work is on display in museums, college universities, large corporations, and numerous residential homes across the country. Overcast involves the securing of a warp string on the end of the oriental rug to prevent further loss of hand tied knots. The process is done by hand using poly thread, cotton, silk, or hand spun wool. We take every precaution to maintain as much of the textiles current condition as possible. Selvedge refers to the sides of the carpet which are wrapped in wool. Through time the wool on the selvedge may wear away. Our technician will match the color of the wool selvedge using our extensive collection of Appleton wools from England. This process is done by hand while taking every precaution to maintain as much of the textiles current condition as possible. 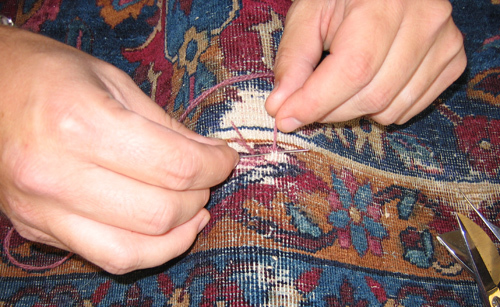 Patching is a more cost effective manner of filling a hole in an oriental rug. Sometimes a textile does not have the value to warrant a reweave (restoration). Patching involves selecting a fragment of like color, design, weave, and age to hand sew into the damaged area of the textile. If a textile is too brittle to sew, a piece of mesh is placed on the back of the textile and patch. The mesh is then covered in liquid latex. Every precaution is taken before we would have to settle on using latex on a textile. Restoration consists of reweaving damaged areas in a textile including warp and weft foundation, hand knotted pile, selvedge (sides), and fringe. A good restoration will be difficult to discern with the naked eye. An expert restoration can recover lost value from a damaged textile. Restoration is Mouladad’s true gift and passion. He views his work as an art form. Foundation work entails reweaving the warp (vertical) and weft (horizontal) grid work on which the pile is hand knotted. The foundation could be made up of wool, cotton, or silk. Our variety of colors of all three materials and ability to custom color allows for a perfect color match. Repiling is the process used to restore the hand knotted pile to a textile. The knots are tied in the same manner as the original textile using either the Turkish (symmetrical) knot or Persian (asymmetrical) knot. Wool is blended and handspun to ensure proper color match and texture. Our ability to color match is known all over the country. Our staff and only a hand full of others worldwide have the gift of color matching. Selvedge repair in restoration is different from conservation. Often times the wool covering the selvedge is not the only damage to the sides. Before the wool can be replaced foundation work may need to be performed. Fringe is a vacuum cleaner’s best friend. Tattered, torn, and worn is every fringes fate. The fringe on an oriental rug is a continuation of the warp foundation. Often the fringe is knotted and serves a locking device to ensure stability in the textile. Replacing fringe consists of matching the foundation with the appropriate wool, cotton, or silk and feeding the fiber into the body of the textile. Upon completion, the fringe will be knotted where applicable. We will use our over 50 years experience in this industry to advise you on your most cost effective manner of repair. Treatment proposals and condition evaluations are given to educate and to establish treatment and budget priorities. See more about our online specials for discounts on services for your Oriental Rugs. © 2006 Joseph's Oriental Rug Imports. Site created by Small Box.